Repairing the world (Tikkun Olam) is an important Jewish value, but does it begin at home or abroad? 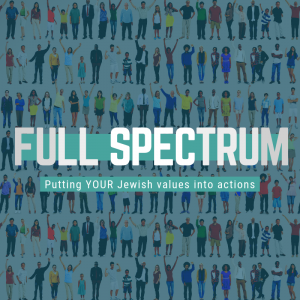 What does caring for “your community” mean to a Jewish person in a multicultural society? Ask two Jews, get three answers – But what’s YOUR answer? What do you believe? Full Spectrum is a hands-on night of interactive exploration of the views of philosophers and activists past and present, including ourselves and each other. We are excited to partner with Mazon Canada for this interactive program. If you ever feel Jew -ish, then this program is for you!